Ok, fine. I'll write you a guest post. Oh, you want to post here?? Well, alright. Probably. First off, shoot me your blog URL, so I can take a look and see what your style is. 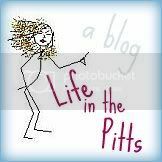 And while I'm checking you out, here are a few questions for you: Are you a long time reader of Life in the Pitts, or are you new to my blog? Why do you want to post here? Feel free to flatter me :) But really, why do you think we would be a good fit? Original work only. It's ok if you've posted about your topic before, but I'll need a rewritten, unique post- not something that is copied and pasted, and submitted to 30 other blogs, etc. Feel free to link back to your blog in the text of your post. Don't go crazy- 3 or so should be enough. People react well to pictures. Even just stick figures drawn in Microsoft Paint. They are not necessary, but they spice it up, and make it pinnable. Pinnable is good. I'll need an intro to you and your blog, as well as a picture of you for the bio. This is good for you, because people are more likely to click through to your blog if they feel like they've connected to you as a person. Please triple check your spelling and grammar. I'm not a nazi about it, but some of my readers may get irritated if it feels like you haven't bothered to proof read. If I need to make any edits, I'll send it back to you for final approval before it goes live. I would appreciate if you post on your blog that you're going to be visiting and guest posting over here. If you do not want to devote a whole post to it, a blurb at the top or bottom of your another post that week (or that day) would be fine. And if you really want to get on my good side, tell your readers about me. Guest posting is a great way to increase traffic to both of our blogs, since you will come in contact with my readers. My side of it- your readers hearing about me- is a little more dependent on how much you want to talk me up. If in a post (or blurb at the beginning/end of a different post) you were to include an intro to Life in the Pitts, and maybe a few links to a few of your all time favorite posts here, the universe would give you about a million karma points. And karma points are always worth it. This way your readers can get a feel for why you read my blog. And you do read it. Right? So shoot me an email. Let's see if we fit.